It was a beautiful mid-summer morning in July, and we plant apprentices were getting ready to learn about medicinal plants. Weaving a thread through from last weekend of stewardship though, we started by going out to sit with some of the amazing medicinal plants that we had planted over a month ago. The changes were staggering, as I went to sit by a beautiful milk thistle that grown over four feet since I had last seen it. With white and green spotted leaves that spiralled where attaching to the stem, and a bright purple blossom facing this sky – the milk thistle was a sight to behold. 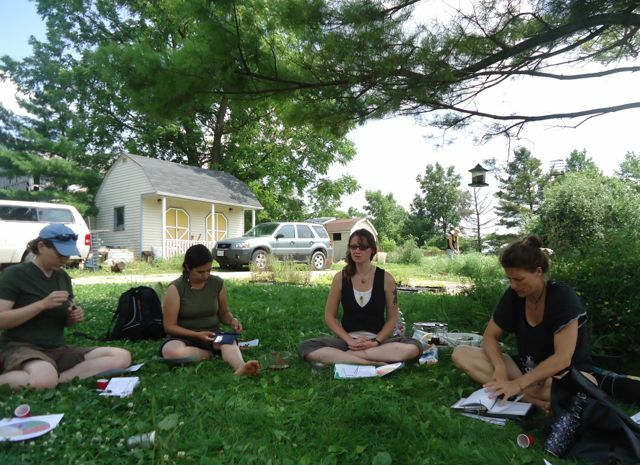 Some others sat with astragalus or hops or calendula, reflecting upon the growth of plants, the bounty of summer, and the beauty of sitting still. After some time, we gathered together to share a few quick reflections before jumping into a session with special guest – Laura Gilmour! Crafting a bitters formula to help with digestion, we discussed all the cultural food practices that would allow for invisible bitters, like eating bitter salad greens or certain pickles to prime our digestive tracts in advance of meals. True bitters are the best way to “tell digestion to take up the challenge of the food we are about to eat”. There are even sneaky ways to incorporate bitters into meals like having a bitter aperitif to toast with before a holiday meal! 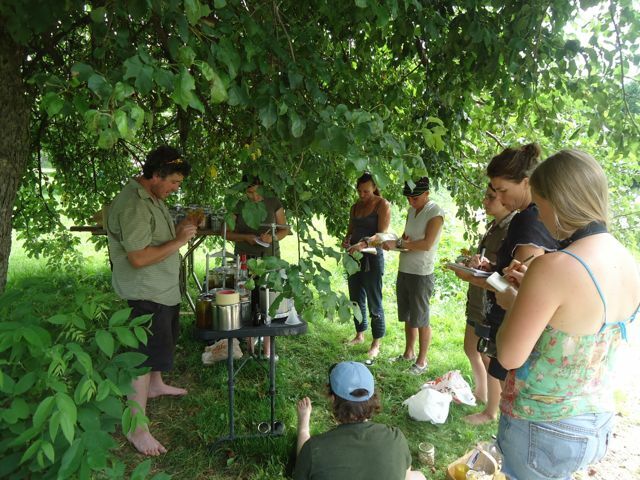 After blending our own unique bitters formula that included some great plant tinctures like angelica, tulsi basil and dandelion root, we were all excited and ready for lunch and a fruit full picnic on the lawn commenced! After lunch, we split our group of 17 into two rotations of some tasting and making activities. Alexis led us through the process of making a healing oil which was infused with St John’s Wort and then a cold and flu tincture made with yarrow, elderflower and peppermint. It’s hard to imagine on a hot summer’s day that in the deep of winter, you may have a rattling cough that needs that tincture – o the changing seasons! 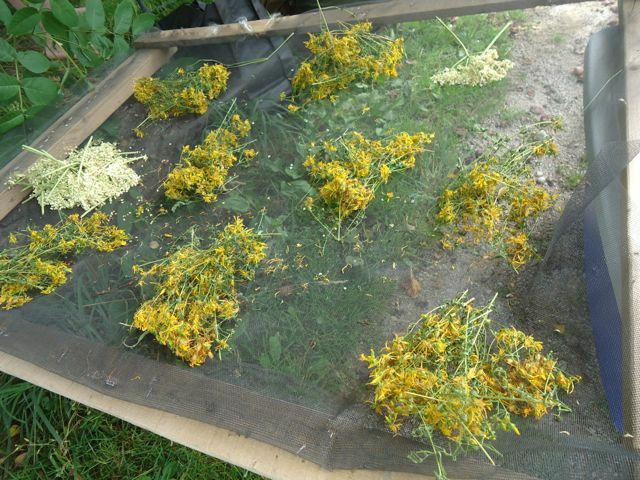 After looking into St John’s Wort more mythical properties – like it can help guard your soul from phantasms! – we made some plant journals on the SJW. Leaving our semi-finished homework behind, we worked with Laura Gilmour, an amazing community herbalist, naturalist and small business owner of Wild Muskoka Botanicals, to learn about flavours and tastes and how that can tell us about the properties of the herbs. We tasted hot horseradish, and yummy, sweet astragalus and salty nettles. Depending on your body’s inclinations and the type of condition you may have, we played around with the types of flavours and remedies that could help. The highlight was definitely nibbling on Schisandra berries – the five-flavoured fruit! So wild to have every flavour in your mouth! As the more official workshops wound down, we celebrated our medicinal plants weekend by sharing a delicious potluck meal with salads, meats, cheeses and so much more – only to top off the evening with a cocktail party! 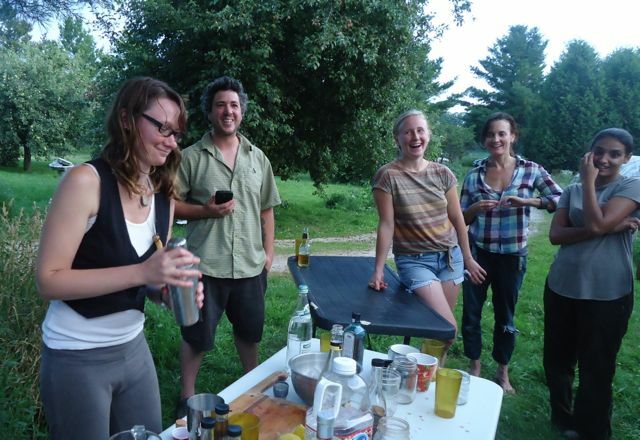 Although cocktail tinctures really are for fun rather than medicine, everyone definitely felt great! How exciting to have such skilled, informative leaders, teachers and all around great friends.